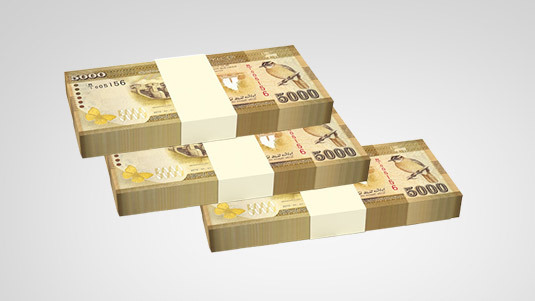 Central Bank of Sri Lanka (CBSL) on Friday printed money to the tune of a massive Rs 48,928.75 million to help meet the Government of Sri Lanka’s (GoSL’s) monetary commitments, thereby increasing the total value of money printing (MP) by a mammoth 25.98% to Rs 237,253.75 million by the weekend, data showed. These figures include both the MP liability to GoSL, plus the related borrowing cost to GoSL due to MP. As a result, GoSL total borrowing cost to CBSL on account of MP, Friday over the previous day Thursday, increased by a massive Rs 676.21 million (19.26%) to Rs 7,976.72 million. The weekend, which pro-rated GoSL’s borrowing costs to three days, instead of the usual one on market days, also helped to inflate GoSL’s borrowing costs on account of MP. CBSL Governor Dr Indrajit Coomaraswamy speaking to reporters on Friday said that GoSL has increased domestic borrowing commitments in the first half of the year as a result of the maturity of previous borrowing liabilities. In related developments, CBSL’s foreign reserves bled by US$ 169.61 million (Rs 25,712.75 million) on Friday, either due to having to meet GoSL’s foreign debt servicing commitments or capital flight from the government securities market (GSM) or due to a mix of both. Coomaraswamy said GoSL’s foreign debt servicing commitments as of now and up to the year end, totals $ 1.9 billion. He, however, said that as of late, net outflows which the GSM suffered previously, mainly driven by one particular investor, has since come to a halt. Due to those net outflows, the country’s reserves had bled by an amount of between $ 400 million to $ 500 million in the past four to five months, the Governor said. That particular investor was responsible for 90% of those outflows, he said. Coomaraswamy said the country’s reserves currently stood at $ 5½ billion.These commitments are met from CBSL’s foreign reserves, instead from the foreign exchange market to prevent depreciative pressure on the rupee. Conversions are based on the administered ‘spot’ rate of Rs 151.60 to the dollar as CBSL deals in spot. Spot trades are settled after two market days from the date of transaction. But, as far as the market is concerned, as it feels that the benchmark spot rate is of an inflated value, with room for it to depreciate further, they have been dealing in two weeks’ forwards these days, which value closed the weekend at Rs 152.55/65 to the dollar in two way quotes, unchanged from the previous day’s (Thursday’s) close, on low volumes. Sources said that the reason for the low values was that the market was digesting Friday’s CBSL’s policy rate hike, where it increased both its standing deposit facility rate and standing lending facility rate by ¼% each to 7.75% and 8.75% respectively. But Coomaraswamy said that expected inflows, most of which are for the current year, comprising $ 1.5 billion by issuing a sovereign bond, a further $ 450 million from a syndicated loan (with the possible scope for it to go up to $ 700 million or even to $ one billion), a $ 200 million loan from a Chinese bank and another $ 400 million from the lease of Hambantota Port to China, with the possibility of a further $ 700 million being raised due to this deal before the year end, would help to mitigate pressure on the reserves, which value, he expected to go up to between $ 7-7½ billion by the year end. CBSL also expects to clinch the IMF’s third tranche of $ 160 million of its three year $ 1.5 billion facility by June. ‘These will be sufficient to meet GoSL’s debt servicing commitments’, the Governor said. before long there will be so much money in circulation that people will start bidding for their grocery an elementary economic principle supply and demand. demonetisation like what the indians did recently and what nmp did few decades back will not help the economy but it will keep the printing costs down. why do we insist on raising dollar loans when most of te stuff that is imported are from china and then india.